While I like most of my plates and crockery to be simple and classic, in the morning I'm open to a bit of whimsical nonsense. I love hearts - as you may have spotted from my favourite Emma Bridgewater mug and bowl set which often appears on this blog. 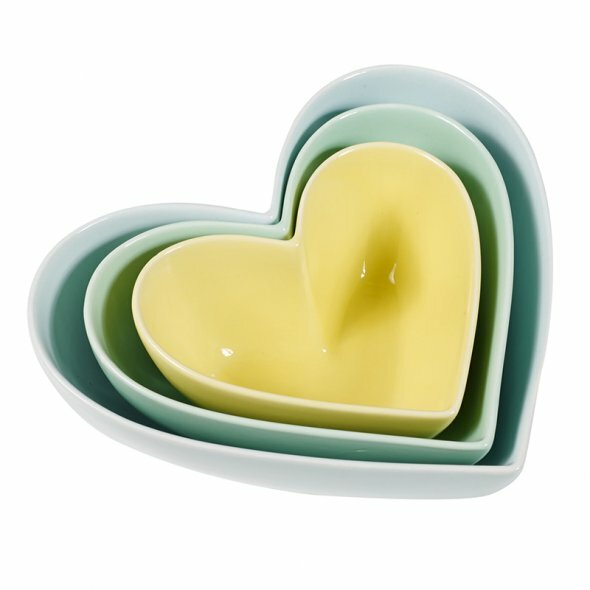 And when I received these gorgeous minty heart bowls as a gift a couple of months back, they definitely fitted in with my love of breakfast. This set of minty nesting bowls (also available in sunset colours) are £15 from Oliver Bonas. At first I thought they were oddly large ramekins, but I soon realised they are just perfect for serving breakfast cereal, yogurt and fruit in individual bowls. Perhaps served next to a side of heart shaped raspberry buttermilk pancakes?